The Soca River is well known for its great variety of activities. The river provides ideal condition for all kinds of adventures, with most of them being perfectly suited to families and groups. The most popular activity is rafting, which is the perfect example – it’s a thrilling expedition that is done in big groups on the most interesting parts of the river. Great experience, but not really suitable for individual adventurers. Luckily, there are other options offering a great time for individuals! Soca River kayak is one option, even though this, too, is frequently done in group tours. 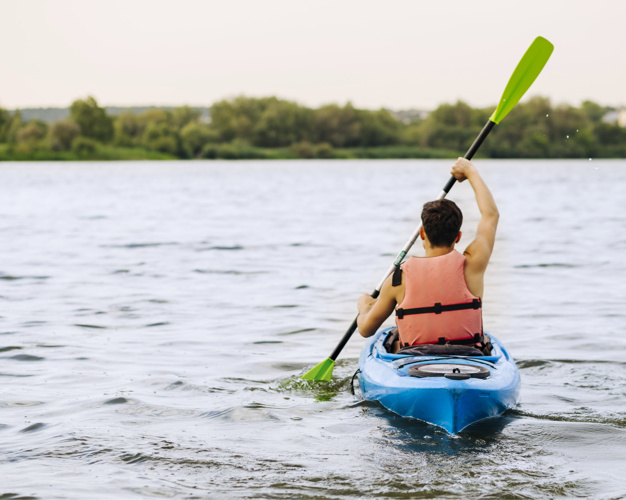 Kayaking is especially favoured by individuals that can make it on their own – experts, that can navigate the river without experienced guides. For such visitors, Soca River kayak presents no problem, on the contrary, there is a wide variety of services to make this activity even more convenient. Tourism services providers can arrange transport and offer equipment rental, as well as other services. Many of those can be tailored to perfectly suit the individual traveller. Even in group tours, Soca River kayak can be fun for a lone adventurer – everyone is in their own boat, after all. There is a similar situation with canyoning – Soca offers guided tours that are mostly done in groups, but can certainly be enjoyed by individuals. It’s very likely that you will form new friendships and bond with other interesting participants in the adventure! If you don’t like that, just focus on the challenges that make canyoning so fun. For canyoning, Soca offers different courses of varied difficulties and durations. Tours are flexible and can be made more attractive for individuals. And there is one more option for canyoning – Soca enables anyone to make their own plans and explore the canyons on their own!